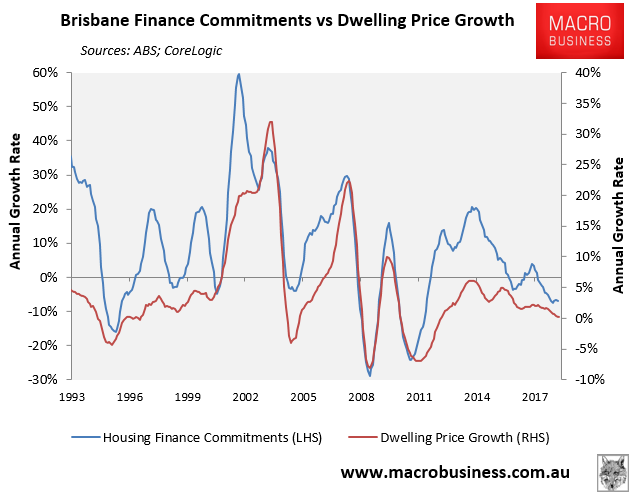 With the release yesterday of the ABS’ lending finance data for November, it’s an opportune time to once again chart how capital city house prices are tracking against both investor and total housing finance. 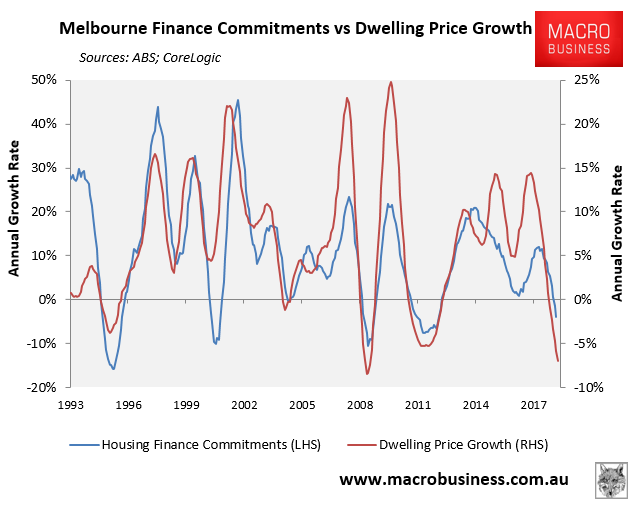 As MB readers know, housing finance has historically been strongly correlated with values. Therefore, it remains one of the best short-term predictors of price growth. 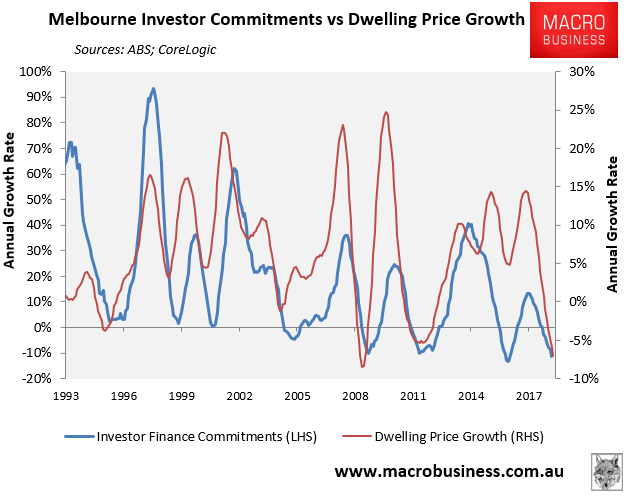 The below charts plot both CoreLogic’s monthly dwelling values index against the value of investor and total finance, as measured by the ABS. 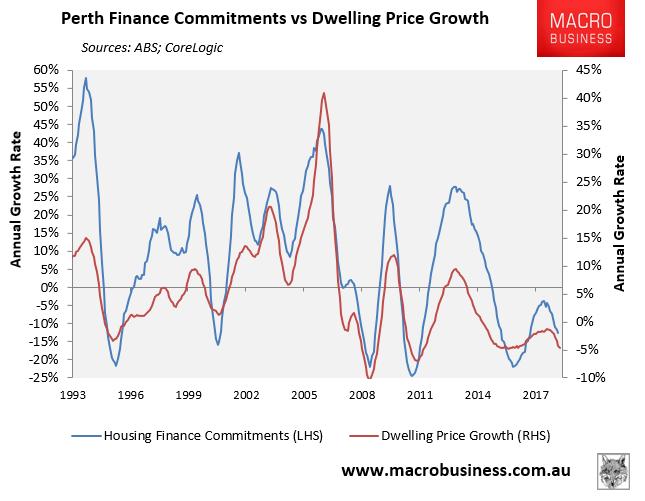 As you can see, investor and housing finance growth as well as dwelling price growth has weakened across Sydney, Melbourne and Perth, but is stronger in Brisbane and Adelaide. 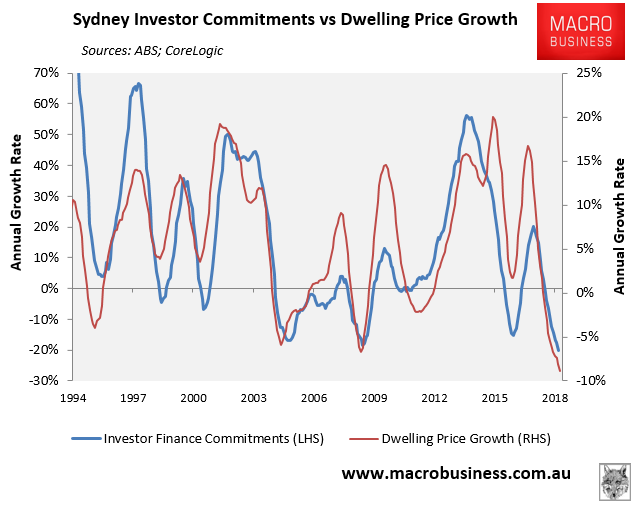 The decline is particularly sharp in the investor mecca of Sydney, where investors remain the marginal price setter. Labor’s negative gearing and capital gains tax reforms in the likely event that it wins the next federal election, which is expected to be implemented on 1 July 2020. 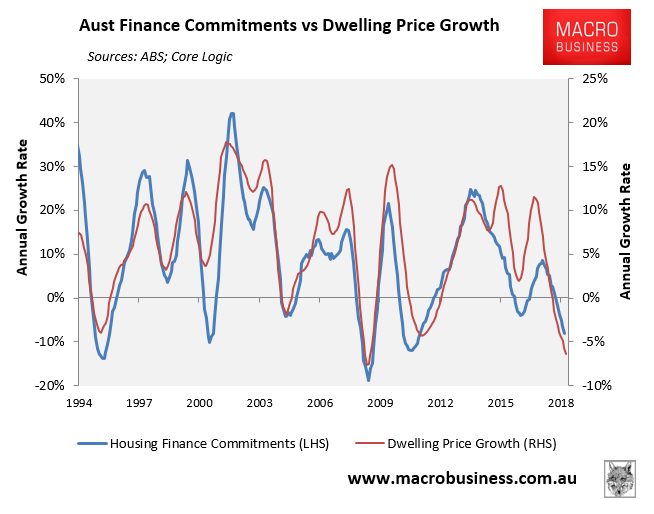 In short, until housing finance turns and begins to rise, Australian dwelling values will very likely continue to fall. If you constrain supply and pump demand (immigration) and create excess liquidity than prices must rise. However if you fix the supply side or constrain the credit side than the marginal buyer will modify his/her purchase decisions and suddenly prices will fall. 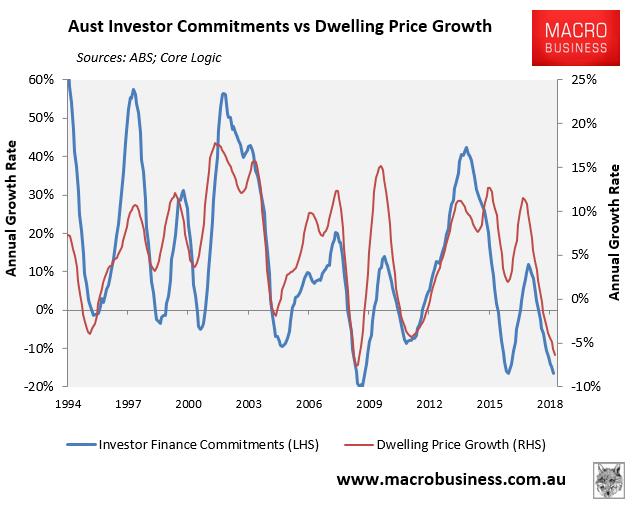 Fundamentals determine supply of housing and demand for housing but prices are still set at the margin.assuming adequate capital is available,.and that’s all before you consider the positive feedback effect of growth, (aka asset speculation). Ah, I see. So it’s the SubPrime Borrowers that set prices. Now, where have I heard that before…? So what’s better then that than? Not sure I understand, why does it matter who the marginal buyer is? suffice to say that at the margin there’s one less buyer and prices adjust to that reality. Anecdotally it would seem that the biggest falls have happened at the mid/top of the property ladder, this suggests that property ladder climbers are atm locked into their segment because they are probably not motivated to buy much the same as they already have. Small scale townhouse developers have completely deserted the market, this is evidenced by the extreme price falls in lower north shore and inner west knock down houses. on big lots. Prices were down 20% in Dec18 but now offers appear to be down closer to 30% so the market is locked up with vendors refusing to sell. these seem to be the biggest two groups that have retreated from the market at least in the parts of Sydney where I follow prices. 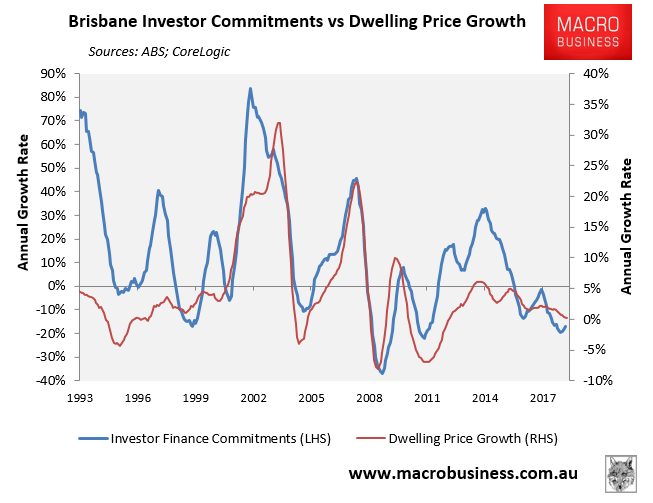 Even Queensland accountants who invested in what they knew was a bubble but who believed the agent who said it would double in 10 years are selling now to beat the crash. He invested in 2009 in the belief that property prices doubled every 10 years, which is a typical sales pitch used by real estate agents. The Thing about bubbles is that even well after they’re recognised they can keep going for a bloody long time. And it’s hard to know when they’re properly dead. I’m beginning to entertain the idea that perhaps we have reached exhaustion point. But wouldn’t be surprised if it did re-boom again through continued immigration pressure and government support (which surprisingly hasn’t been deployed yet). Immigration is already record high and adding more while unemployment is on the way up maybe hard (they used this rates/immigration trick last time to prevent crash in 2013). In 2015 they used rates/IO loans trick. What is left now? 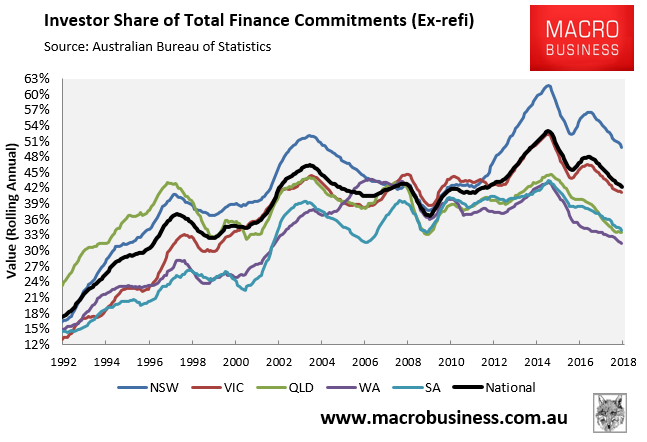 Some rates cute but if not passed by banks they may do more damage if people see RBA hopeless. The government has plenty of tricks that it can pull. Interest rates can be forced lower, down into the low 3s. Peachy here is your saviour. The first two in your list are highly unlikely Peachy (massive distortions, massive incentives to declare FHB status, massive inequities (“But I bought one just two months ago… why aren’t MY interest payments deductible?”). The last one is quite plausible. I do expect the RBA to give the money printing presses a good crack. @Peach None of those solve the over-indebtedness problem or prevent deleveraging from taking hold. Rate cuts is their only instrument… and they’re cornered on this front. @Gavin: “A “meaningful” change APRA could make would be to lower the 7 per cent minimum interest rate at which banks are required to test all new customers, which is about 3 percentage points higher than interest rates banks actually charge.” oh yes, there are many levers, that is one of them. APRA would probably need to get a nod from the Treasurer to make sure they get immunity from future prosecution/RC caning if they want to do something like this. @EvenSteven: desperate times – desperate measures situation. Major distortions don’t matter if there is “the economy” to “save”. ATO audit activity can be dialled up or down as needed to either encourage or discourage FHB fraud and overaimkng – from FIRB levels (one guy, looking the other way) to Rio Tinto levels (dozens of specialists, looking through microscopes), as the situation dictates. @Brenton – the only “solution” to the overindebtedness, as far as anyone who matters is concerned, is more debt. Much more debt. Peachy is right though. More debt worked in the past and that’s all they know. To a bank, debt is awesome, its the asset that earns them money. These guys are all banksters. There’s still a lot of tricks left but the easiest way to know what’s likely to happen is to check out what they did in the US, short of QE which probably wouldn’t work very well for us. No, Peachy is not right, because what they’ve always done in the past is to cut interest rates. Now they can’t, not with any meaningful effect and not without consequence. More debt. Cutting interest rates was how they did it i agree. I also agree cutting (or raising) IR cannot happen. However keeping in mind that the banks want a slow melt, more debt may simply not happen. Exactly. So if their only lever for meaningfully stimulating credit, and for simultaneously alleviating debt burdens, is now effectively snapped off, what do they do? They’ve already stimulated FHB’s, who have proven incapable of offsetting the investors that drove prices beyond sustainability. FHB’s lack the incomes, capital and sheer numbers. Investors are already tapped and overextended via IO sub-prime style lending. They’ll use the last of their cuts, just in time for a global slowdown. Goodluck with that. Government support hasn’t been deployed because it would be incredibly costly: Think about the hit to the budget of making interest tax deductible given household debt service ratio is 15%.of disposable income. Also it would be incredibly regressive given the vastly higher share of debt held by high income households. They could do some of these desperate measures but only after they declare ecomonic cataclysm just before elections. Remember main goal of political elite is not to save economy but to stay in power. Sentiment is everything, and now the genie is out of the bottle and you cant put her back in. The illusion that house prices never go down has been shattered. And that’s all that it will take for buyers to withdraw from the market. They thought Australia was different, now they look to Ireland and the US for insight into what might happen if they buy now into a falling market. And as the answer is quite diabolical, they decide to sit tight where they are, save up their deposit money, and wait for the bottom. I dunno! Do we really believe that RE investors here are sufficiently savvy to be looking at Ireland and the US? Not yet I think. As someone, who I generally regard as having some perspicacity (not sure who) wrote the other day, most are now thinking it will be 2 or 3 rough years and then it’s off to the races again. They all watched The Big Short. Margot Robbie was in it. Silly question, but total finance commitments – is it the amount of debt issued in dollars? The number of mortgages issued? Or something else? It’s total value of housing finance commitments issued, excluding refinancings. 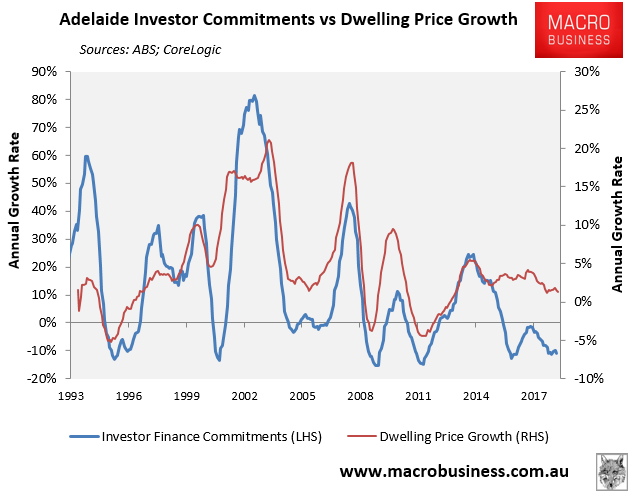 Looks like a double bottom for investor commitments (in Adelaide, as forming now) is the sign of a price growth bottom. 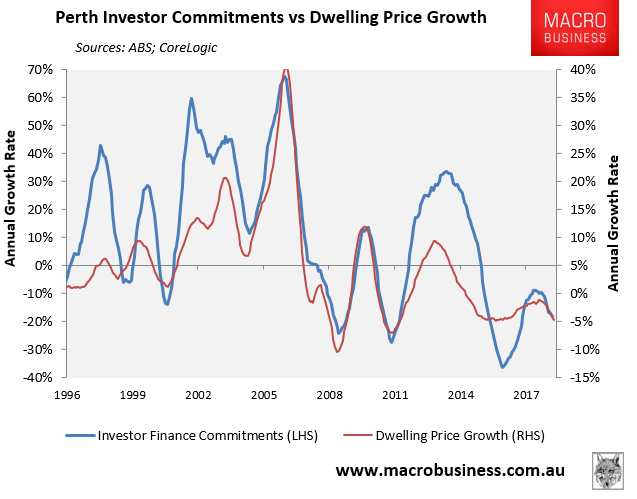 This makes it very clear you would be mad to buy now ahead of the negative gearing changes . It’s all investors driving this ponzi scheme . Prices will likely fall for years in real terms and that’s after this current cash has worked its way through . Ontop of the NG changes the banks just won’t be able to internally generate capital through rising asset values they way they have in the past . Mad to buy ahead of a change in the CGT discount to lock in 50% vs 25%? Depends on your investment horizon I guess. Is the CGT discount grandfathered as well as the neg gearing? I assumed it would not be. There won’t be any capital gains to tax. Get ready to buy any investment assets you plan to hold over the long term (whether that’s property or something else as the discount is decreasing for all assets). Bowen’s post desist seem till say CGT will be grandfathered to me. Do you have a link to the 2016 announcement at hand? Zulu, what do you think “Current investors would not be affected.” (by the CGT/NG changes) means? The ALP link is the 2016 policy proposal. Actually Chris’ point is very relevant and although a quip is, without doubt, true. Labor are planning spending on all the extra tax they are going to collect. There isn’t going to be any and that is a whole other discussion – I do mean financial discussion not political. Mad to buy now? Maybe… but some of us just want a home to live in and if you’re in a position to buy 1 almost outright, why not? Unless you think you can wait and buy 2 later? Same here, had enough of renting in Brisbane but wondering if it will start following Sydney/Melbourne down. Same boat here. But waiting a year to save $100k minimum, totally worth it. Finally lost for words peachy? 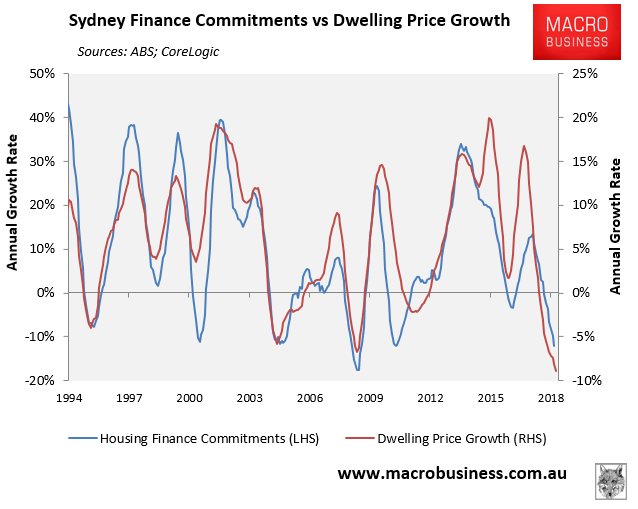 Australian home prices have now been falling for more than a year, led by increasingly steep falls in Sydney and Melbourne, Australia’s largest and most expensive housing markets. 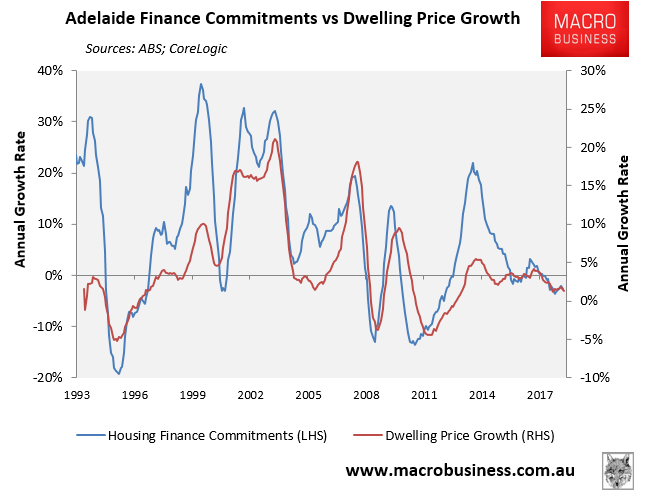 Mr Plank also says the current situation is somewhat unique, noting that rather than being driven by higher mortgage rates, the downturn in the housing market has largely been caused by the introduction of tighter lending standards. Mr Plank is an absolute plonker. Unique as in the first time ever, never happened before in STRAYA ??? Mr Plonker is onto something here, historically low interest rates and bottom of the barrel lending standards ? Time to plank the plonker or is the property market taking its final walk off the end of the plank ?